In many families, skiing isn’t just a sport, it’s a rite of passage. As soon as the little ones are old enough (for many, that can be as young as 3 or 4), it’s time for them to start hitting the hills. Skiing isn’t easy to learn though; it takes lots of practice and patience before you can start feeling confident on the slopes. Parents can help their beginner skiers along by teaching them the essentials and making their day on skis an overall enjoyable atmosphere. Teaching kids to ski can be a rewarding experience, and can also save you lots of money in comparison to ski lessons, which can get quite pricey. Set your son or daughter on the path to a lifetime of skiing fun using these tips and tricks. If you can remember the first time you went skiing, you know that it takes quite a while before you feel completely comfortable and in-control. After all, you are essentially balancing your entire body weight on two sticks that slip and slide in ways that you’ve never experienced before. Your child will likely find themselves in a cycle that goes something like: fall, get up and fall again. This is ok; no child is going to master skiing right out of the gate. The best way to navigate this process is to go at a speed that your son or daughter is comfortable with. Have your child get comfortable with one thing at a time before moving on to the next step, starting with walking around in ski boots. Once they are used to having boots on their feet, then strap some skis on their feet and let them stand and slide around on level ground. The goal here is to get them accustomed to moving with the skis as an extension of their body, which will make it easier on them once they get on a hill. At its most basic, skiing requires a few crucial maneuvers: stopping and turning. Like anything worth learning, these will take some practice, but your kids will need to have these skills down pat before stepping up to anything bigger than the bunny hill. Stopping: The most important maneuver your kid needs to get down is stopping. Without this, your child will have no way of protecting themselves from the dangers of gravity. Teaching them a wedge is the best and simplest way to give them the power to stop themselves from crashing into anything or anyone. Have them practice moving their ski tips together, then back apart. Practice this motion on flat ground before going on the hill so once they get moving they are familiar with the feeling. The goal is to get them to stop all on their own, so try to avoid acting as a cushion that they can ski into, as this can only reinforce bad habits. Turning: Once they feel comfortable stopping, then it’s the time to have them work on their side-to-side movement ability. It’s important your little ones can maneuver around the hill to avoid any potential obstacles or people they cross paths with. Start by making large “S” turns across the entire hill. This will gradually ease them into turn making. It may help to have them follow in your tracks directly behind you, as it’ll be easier for them to mimic your motions and route. Eventually, as they get the hang of it, try making the turns tighter and tighter. Throwing the whole book at them all at once, so to speak, is a surefire way to ensure they end up confused. Work on one skill at a time, repeating it until your child can perform it with ease and consistency. Build up to harder maneuvers, using the ones they already know as a basis for the next. Make it into a game: Play follow the leader, tag or any other childhood favorite, only this time on skis! This will help your child practice their movement skills while keeping them from overthinking what they’re doing. Come up with nicknames: On flat ground he may be Steven, but on the hill, he transforms into Speedy Stevie. Fun nicknames will keep spirits high and make them feel like a superhero out there on the snow. Use your imagination: A good incentive to learn how to ski? The dragon that is chasing behind you, or the puppy that needs rescuing from the incoming avalanche. Take them out of the ordinary and let their imagination run wild. When all else fails, a quick trip into the lodge for hot chocolate and a snack can do wonders for morale. Remember, you don’t want to push them too hard. You want your kids to come out of this experience with a positive impression of skiing, not a memory of being cold, wet and miserable. If you notice them getting particularly upset or frustrated, take them inside to regroup and hit the hills again when they’re feeling up to it. Preparation is key anytime you head to the mountain, but especially when it comes to first-timers. It’s better to be safe than sorry, so pack extra gear and clothes. 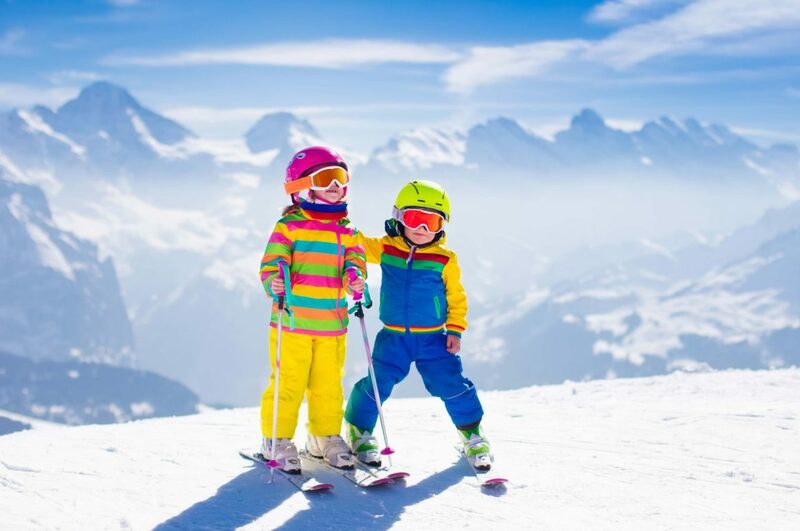 For more info on what to bring, the National Ski Areas Association has some good tips for getting you and your child properly prepared to hit the slopes. You must go into the day expecting a handful of wipeouts, so a change of socks, pants, and any other winter garments your child is wearing is encouraged. Skis.com has got you covered with a wide selection of kid’s outerwear, including the latest in snow pants, accessories and more. You may want to consider some training products, as well. The Hookease Ski Trainer is a mounted clamp on the back of your child’s skis that hooks onto the end of your ski poles, allowing you to control the speed and movement of the skis. The Hookease gives you the opportunity to show not tell the ski maneuvers you’re trying to teach them, letting them feel the proper movements for themselves. Another helpful tool is the Edgie Wedgie, a bungee that connects to the tips of both skis, making forming a wedge as simple as spreading your legs apart. Teaching your child to ski can be an arduous process; it may not be for everyone. Luckily, there are plenty of great instructors out there who would be happy to give your child a lesson. For those that want to give it a shot themselves though, just remember to be patient, be safe and, most importantly, have fun!